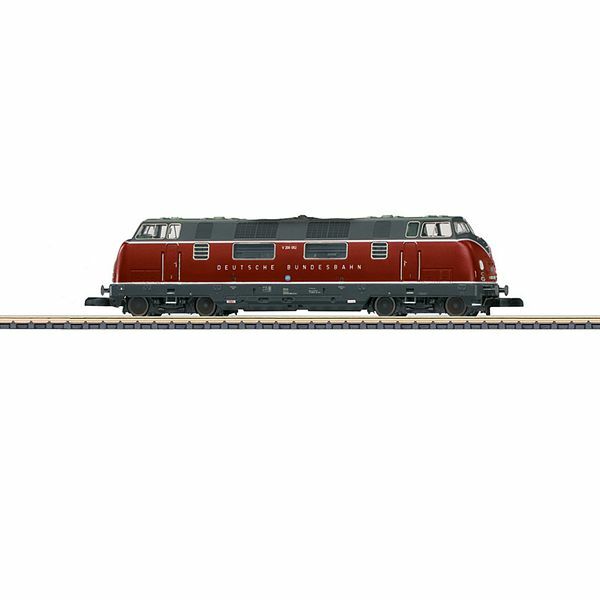 Prototype: German Federal Railroad (DB) class V 200.0 heavy diesel hydraulic general-purpose locomotive in the elegant crimson/gray paint scheme. The locomotive looks as it did in Era III around 1958. Model: All of the axles on the locomotive are powered. The model has a motor with a bell-shaped armature. The locomotive has dark wheel treads. Maintenance-free warm white and red LEDs are used for the lighting. The headlights and marker lights change over with the direction of travel. The engine room details are modelled, and the locomotive has a fine complete paint scheme. The locomotive is lightly weathered in the roof area. Length over the buffers 84 mm / 3-5/16".